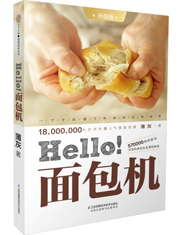 In this book, Bo Hui teaches you how to make mouth-watering bread. Bread machine and oven can be found in almost every family kitchen. But many people buy the stuff on a whim and seldom use them. In this book, Bo Hui teaches you how to make mouth-watering bread from easy-to-make toast to fancy bread. The book offers detailed guidance using simple and clear pictures. Readers can also find useful and key tips to avoid culinary errors.